15: If not a citizen of the US of what nation are you a citizen or subject? 1) Most of the time the major point of interest for me looking at the Draft Registration is the date of birth the individual chose to write down. It doesn't surprise me that the SSDI records Aaron's birth in February of 1897. 21 year olds claiming to be 20 weren't uncommon. I do note that at the date of registration, Aaron would have still been three months shy of his 20th birthday, but he was either told to round up, or made an error in filling out the form. 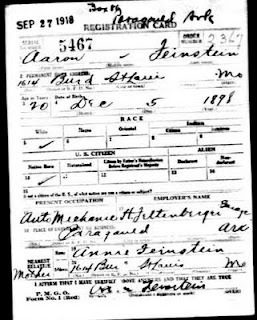 2) Aaron's place of occupation also stands out. I am unsure how he obtained the job as an auto mechanic iin Paragould, which is a good 200 miles south of St. Louis. By 1920 he was a chauffeur for a Saul Bertig in Paragould.